The giant panda, or panda bear, is a large black and white mammal native to central-western and southwestern China, today classified as a member of the bear family (Ursidae), though its unusual unbearlike features and habits for a long period consigned it to its own family (the Ailuridae). 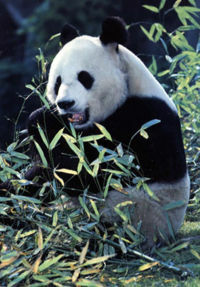 The giant panda has a diet which is 98% bamboo, with other foods including fish, honey and yams. The giant panda is an endangered animal, with an estimated 3,000 pandas alive in the wild, though intensive conservation efforts have been made by the Chinese. Evolutionists such as Stephen Jay Gould have tried to claim that the panda's thumb, which is a modified seamoid bone, is evidence of evolution. Gould claimed that an actual Intelligent Designer would have made the panda's thumb the same as the human thumb. But all this shows is variation, not evolution, possibly occurring in the panda. This argument also assumes that the Designer would want to design the panda the same way He designed the human. This assumption depends on revelation or hubristic assumptions about the nature of God. The World Wide Fund for Nature uses a giant panda as its logo, and the animal has been an enduring symbol for wildlife conservation for over 40 years. In the movie Kung Fu Panda and its sequel, Po, the protagonist, is a panda. In World of Warcraft, the next coming expansion Mists of Pandaria, the new race, the Pandaren, are modeled after Pandas. ↑ Woodmorappe, John, Panda thumbs its nose at the dysteleological arguments of the atheist Stephen Jay Gould, Journal of Creation 13(1):45–48, April 1999. This page was last modified on 26 September 2018, at 11:58.